Philip Levine is a creative maven. 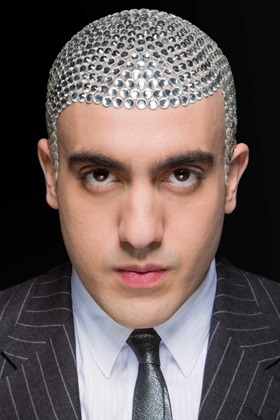 Born in London he started using his head as a canvas for creativity back in 2006 when he began to go bald. He did not want to conform to shaving his head like everyone else so started using it as an art form to express. Philip’s head designs have now become iconic within London’s fashion and art scenes which culminated in his debut exhibition ‘Headism’ in summer 2011 sponsored by Gillette. As a tastemaker, he has gained recognition with sites including Trend Hunter and NotCot with such terms as ‘Baldazzling’. His designs are inspiring men and women alike who might be bald. Philip is a cultural consultant, having worked at Two Penny Blue, a creative agency dealing in brand, sponsorship and business development. He is also co-founder of the collective Lazy Gramophone, a couture arts and design label that supports developing artists by running a Dylan Thomas Prize nominated publishing label, gallery and events. He is business developer for innovative ethical fashion designer Ada Zanditon’s label and runs alternative club nights including Musicali Fragalistic. He is also part of The Observer Future 500 2011. Philip showcased his best head designs in his exhibition ‘Headism’ in May 2011 through photography by Daniel Regan, documentary by Viviane Castillo and sculpture supported by Lifecast. Throughout April 2011 in build up to the show there were over 10 posters of Philip’s head designs displayed on the underground and a 1 week digital projection film at Liverpool Street Station supported by Art Below. PL: The Future I Choose is one where creativity and business are acknowledged and taught on an equal par and that sustainability is achieved for the environment. PL: To me it is the communication with people and what can be formed with that. PL: Not everyone does – so it is to recycle as if second nature. PL: C.A.L.M is the charity I support: The Campaign Against Living Miserably, raises awareness of depression amongst young men: If enough support was given one day it shouldn’t have to be a charity anymore because we are aware of these potential problems. PL: One of my favourite songs at the moment is Move Your Body by NABEF (National Association of Broadcasters Education Foundation) featuring Beyonce – I love the idea behind it. The BBC and the iplayer – Its obvious but I always got to it.